Ship Products When You Promised, Not When You’re Ready. The note card is missing – the photo is from 2015. Shipping Is A Way Of Operating. Scrolling Twitter the other day saw Dan Mall had quoted Shawn Blanc, who in turn was quoting Jason Fried. "Ship it when it's useful, not when it's done." 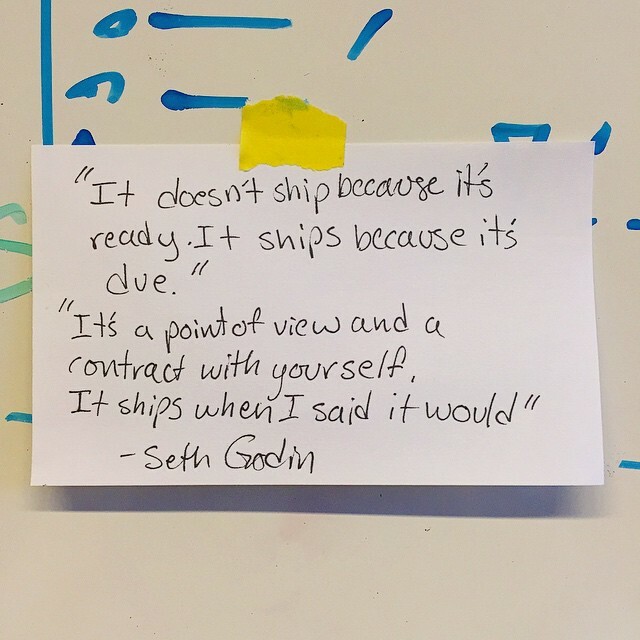 There are a handful of simple quotes that reference shipping it before it’s done. “It” is the product or services you’re working on. These could be cliché quotes, instead, when put into action they are a way of operating. I find it insightful how Shawn kept the quote in front of him “for the past six months or so” he made it a mindset. Your mindset can be deliberate or passive. To internalize an idea, you have to focus on it. In our world of 3X audiobook speed and monthly releases of new “best” practices in every industry, it can be hard to hang on to a few key principles. Returning to the same mottos and mantras is hard when knowledge is packaged in fresh ways all the time. Promising yourself to “ship it when it’s useful, not when it’s done” is just one way of operating, and a good one. Be intentional with how you operate. Quotes Are Not Enough, Action is Needed. I’m reflecting on this “shipping” conversation as I’ve been working on a side product involving conversation UI and automation. In my work for others, I keep the ship when valuable idea top of mind, but in my own work I’ve fooled myself. For this side product, I never set a due date. I never set a flag in the sand of when the product would be valuable. I decided to go with my gut. I thought because I make a living reimagining and making products for others I could skip this step. It turns out when you’re the leader, and no one is holding you to a deadline or due date, you have to make standards for yourself if you want to operate with speed and clarity. Whatever you make, there will always be more to do, not putting a flag in the sand means you’ll always find more and put off getting your work into the world, in front of customers. Put the quote of others on your wall – put a flag in the sand; then take action yourself. At an innovation workshop, I had a conversation with someone who worked in the marketing department of UPS for years. They described how the UPS company culture was deeply rooted in their founders’ ethos, and it makes sense why. In 1907, at the age of 19, in Seattle, James E. Casey founded UPS with $100 and two bicycles – or so the story goes. Two bikes and $100 is all it took for Casey to start shipping value to customers. The story shows how little we need to bring value to other people. Maybe I’ll look for that not card with the Seth Godin quote on it. Tape it back on my whiteboard. Either way, making a change requires action. Previous Post Don’t Show Your Work to Customers.